I admire them for being able to smile. Did you read about Cristina and her husband...? Yes. I feel sorry for them, it must have been a tough day. 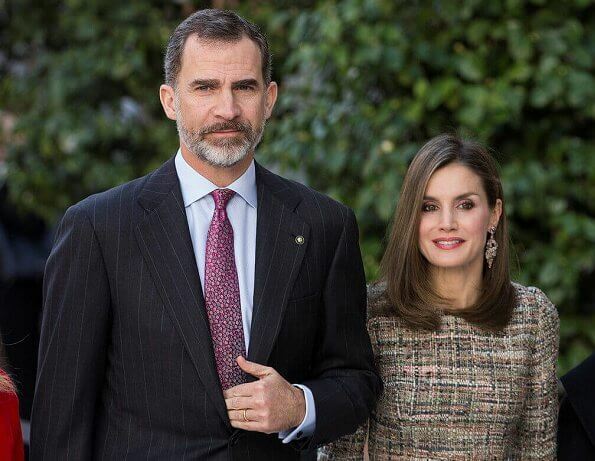 I love Letizia and Felipe , but if it was that complicated they would not have made the appearance in this specific day, idk I really like them but it makes me confused that the family is not united (maybe because I'm very close to mine). I feel sorrier for Cristina and Iñaki because they were the escape goats. Brother in law in jail and younger sister in exile to Portugal probably. And Letizia and Felipe behaving like it is any other day. fine? Nobody forced them to be criminals. Their poor kids are the ones I feel most sorry for. Parece que a alguna gente le gusta hablar sin saber. 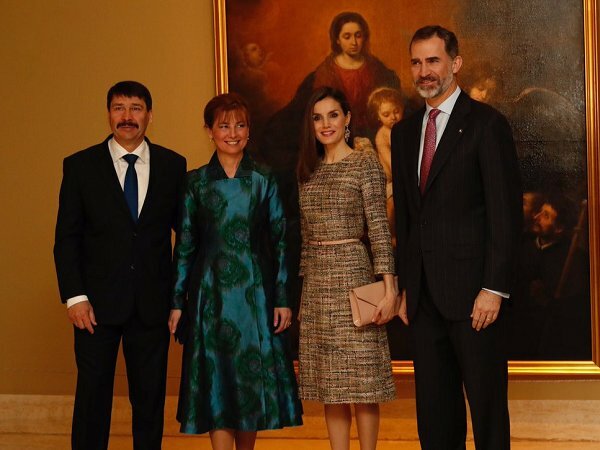 Felipe y Letizia inauguraron la exposición de arte de Budapest en compañía del Presidente de Hungría y su esposa. ¿Tendrían que haberse quedado en casa y abandonar a sus invitados? ¿Y por qué se iban a ocultar si ellos no tienen culpa de nada? Hacen su trabajo y lo hacen muy bien, no como esta pareja de sinvergüenzas que han arrastrado por el barro su nombre y el de toda la familia. This event had been planned for months, especially since it included the President of Hungary and the opening of a museum exhibit. The announcement of the verdict was a matter for he courts and not under Felipe and Letizia's control. A crime of such seriousness was involved here that King Juan Carlos was forced to abdicate as it threatened to bring down the Monarchy in Spain. Felipe's distancing from his sister was needed because she refused to yield in anything. Her insistence on retaining her succession rights despite her father's pleas is what has separated the family. I am not a royalist--although I enjoy royal fashions as it is quite fun--but those writing in sympathy with Cristina should understand that her and her husband's actions brought an end to her father's reign and left her brother holding precariously to his official role. He needed quick and radical action to separate her form the crown--a firewall, as the Spanish press refers to the separation from his sister. She has been found innocent, but only because the courts have decided that she is a "mujer florero"--a flower vase woman--merely decorative and completely oblivious. The Monarchy is still facing rumors that the courts have been too lenient with her because she's a member of the royal family. I have little sympathy for her and even less for her husband. They benefitted through millions of Euros of illegal contracts for which they avoided paying taxes. The law would not let us get away with that. The Crown knew all about it. Very true, regular folk wouldn't have got of as lightly as Cristina. Simple dress in beautiful fabric and colors and so elegant. Different shoes would go better with that dress not peep toe shoes . I like this very much. Much softer than her usual style. Very very nice outfit. I really like this one. Classy. Letizia knows how to put herself together. She makes an effort and it shows. She has respect for her role. Side note ~ Louis and Tessy were granted a divorce today. That was super fast. She hardly ever misses with her fashion choices these days. Another great look. I love this look - elegant and classy, as everyone has said. I don't like peep toes at all - at any time. I have photos of my mother wearing them in the 1940s. They didn't look good then either. I love this outfit, and we still don't know who is the designer... I like the addition of the belt, earrings, hair and makeup, very lovely!!!!! Sorry did not like the shoes, out of style and inappropriate for the dress material (sort of tweed), a dark green, sand, even lilac/violet would have made it totally chic. 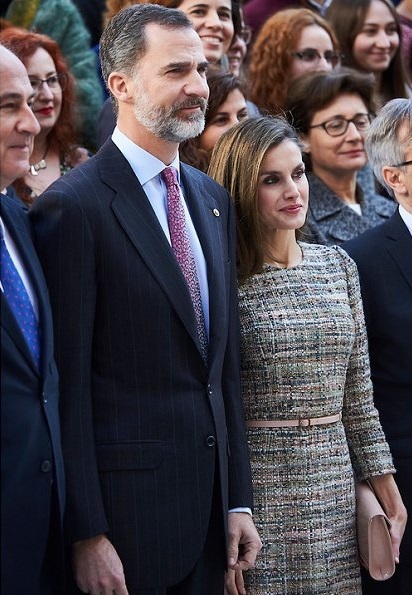 From a fashion point of view, Letizia looks good, she's very well put together. I also like the color and shape of the dress of the wife of Hungary's President. She's vibrant. Here's a woman comfortable in her own skin ! She knows exactly what suits her, and she wears it with confidence. 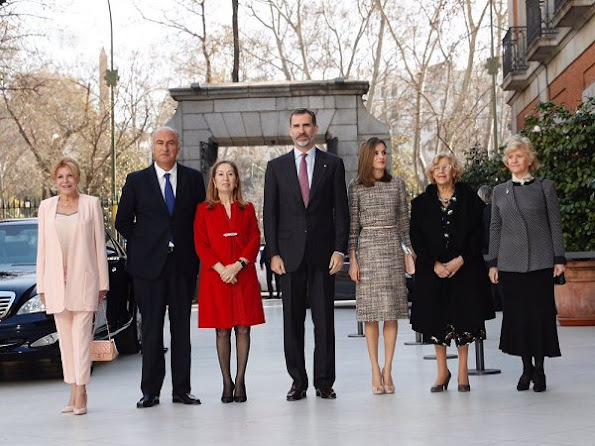 Letizia is beautifully groomed as usual, however, I hope her platform shoes do not make a reappearance, they were never a favourite of mine. Letizia ist soooo elegant - sie sieht wieder sehr schön aus (wie immer).